Bananas are a marvellous fruit and, like me, you probably include a bunch in your shopping trolley. But how many of us think about how they are grown? One Kiwi business just down the road from where we live has not only thought about it but have been active in ensuring the farmers and plantation workers who grow their bananas receive a fair living wage and that toxic chemicals are not used in their cultivation. All Good Bananas operate out of a suitably banana yellow corrugated iron shed in Grey Lynn. 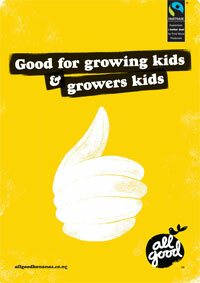 "Good for growers. Good for you"
All Good Bananas first grabbed my attention in the local community newspaper where I read they had become the first New Zealand business to be named amongst the World's Most Ethical (WME) companies. That is sure an achievement for a company that employs just ten staff, especailly when other companies recognised are commercial giants like Marks & Spencer in the UK and Wholefoods in the US. 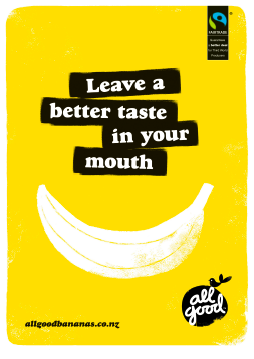 All Good Bananas website convinced me that I should change my banana buying habits. 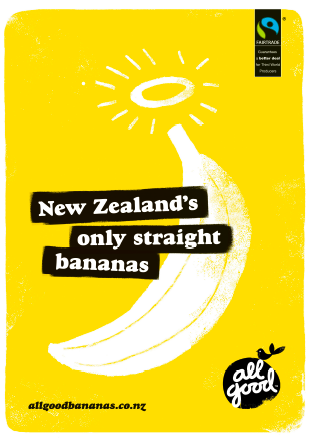 On the website you can search where their bananas are sold all over New Zealand. 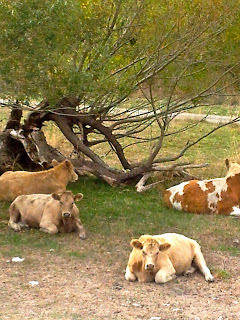 To my friends in Dunedin, Taste Nature sells them. Bananas are versatile. They make a smoothie rich and creamy, boost a winter breakfast when allowed to just warm through in a pot of hot porridge, and can be your pre packed lunch on the run. When the skin turns brown and spotty, welcome them to the world of baking and muffins or banana cake. My bunch of All Good Bananas were used to make a quick, easy and delicious dessert for our friends Julia and Graham. brandy or any preferred liqueur (if you wish to flame the bananas)...1-2 oranges. Gently slide in Bananas cut in half lengthways. I used Waitaki Honey that perfumed the kitchen wonderfully while I cooked the bananas. 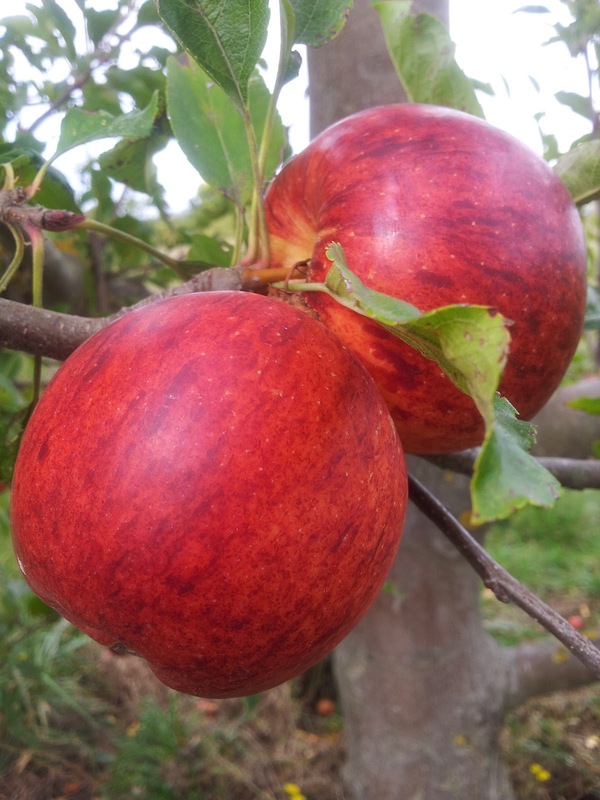 This honey was featured on my posting "Waitaki Honey with Plums and Basil"
To buy All Good Bananas you usually pay $3.99 a kilo which is $1 more a kilo of non Fair Trade bananas. The dollar difference ensures that growers know the price they will get and the premium they are paid has resulted in community projects, like building schools. My friend Julia is an excellent baker and generous with it. She's always whipping up a cake for someone at work or a friend who is celebrating a birthday. I thought of Julia when I wanted to find a different and good banana cake. 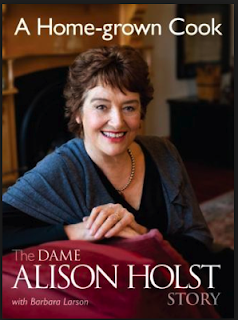 "Here's How" made in Dunedin Dowling Street Studios. Julia suggested a recipe from home cook doyenne, Alison Holst who has written over 100 cookbooks. Alison has named it Crazy Cake - not sure why, but then Dame Alison has earned the right to call a recipe anything she wants. It's a chocolate banana batter cake. Julia has successfully tripled the recipe and cooked it in a roasting dish as a celebratory cake for a large crowd. I believe the best cakes are made by creaming butter and sugar with eggs, but I have to admit this cake was delicious, very easy and light. I think it's the combination of vinegar and baking soda that gives the batter the lift to make the cake light. The addition of banana ensures a moist cake. and vinegar ready to be added. How simple is that! Turn on the oven to 180 C.
Bake for up to 40 minutes (could be sooner). If you start to smell cake -or if its starting to shrink from the side of the tin, that's a sign that it could be ready . Otherwise test with a skewer if you are unsure. I used a 20 cm ring tin, and daughter Tansy iced it with a delicious icing that included melted chocolate, Dutch cocoa and a dash of cream. As this was Peter's birthday cake I did use the best ingredients I had - cold pressed sunflower oil, red wine vinegar and Dutch cocoa that I couldn't resist purchasing at the Parnell French market. The man selling the cocoa advised me to use less oil or butter when baking with the Dutch cocoa because it is so high in cocoa fats compared to what we usually buy here. So for this recipe I took the oil down to 1/3 cup. the birthday moment of blowing out the candle. I never knew that bananas could lift your spirits. By buying bananas grown without exploitation of the environment or the people growing them, then you will feel doubly good. I've decided that I will pay the extra and buy All Good Bananas from now on - even if it means a few less bananas - quality not quantity. 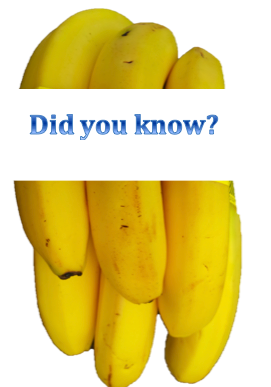 All Good Bananas have 4% of the domestic market share. Remember, their website lists who stocks them. Go on... find yourself a proper 'nana! 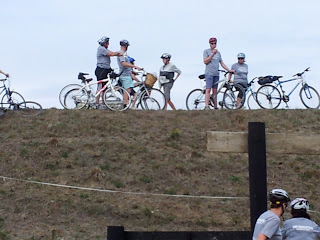 The Big Easy - I liked the sound of that as a sports event - cycling from Church Road vineyard in Taradale to Black Barn vineyard near Havelock North via a number of eateries. 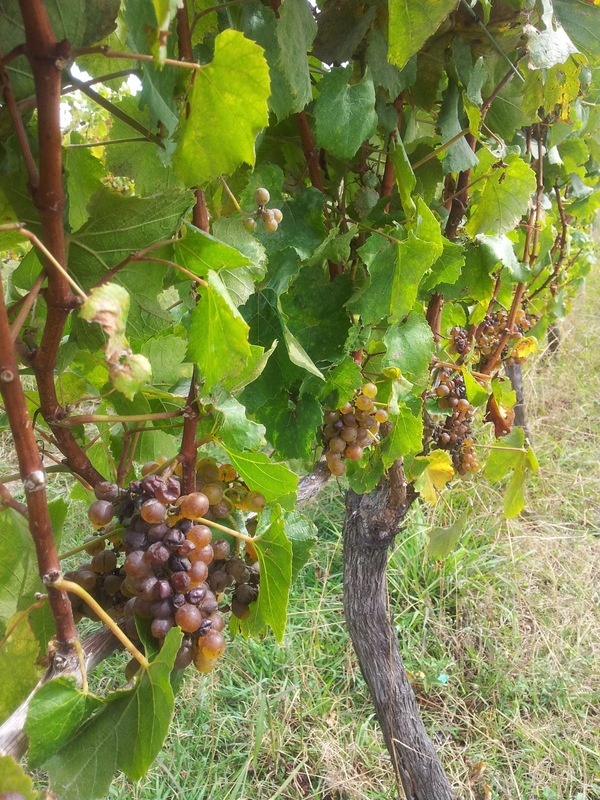 I heard the words vineyard to vineyard very clearly, but failed to think too much about how I was going to accomplish the 43 kilometre ride. The offer of free Hawkes Bay Gala apples along the way certainly kept me going. 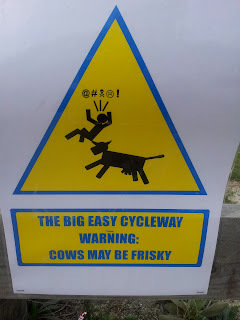 You see so much when you cycle. 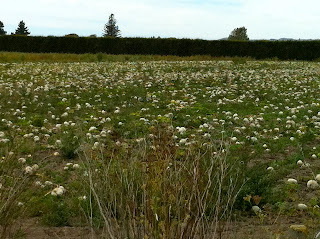 From the tracks I got an opportunity to see orchards, vineyards and farms up close. 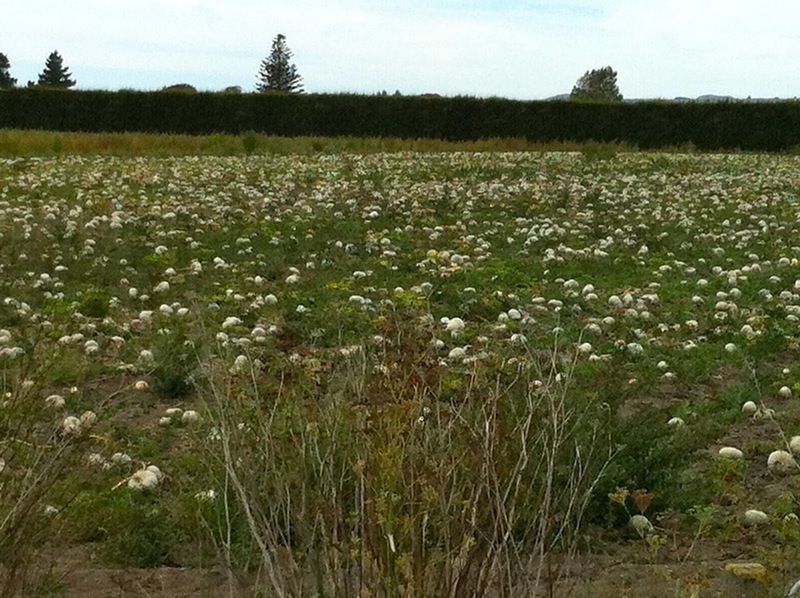 Here I was in Hawkes Bay at harvest time. But to digress... to the Hastings Farmers Market. Hastings Farmers Market every Sunday. In warmer weather all the vendors, like wagon trains in a western, form a circle inside the showgrounds under the shelter of large trees. In winter they ply their trade under the grandstand and in a nearby building. 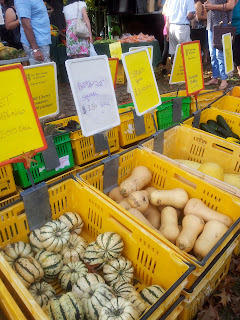 I went to the market to find inspiration for an easy autumn produce dinner. So many delicious products to choose from! 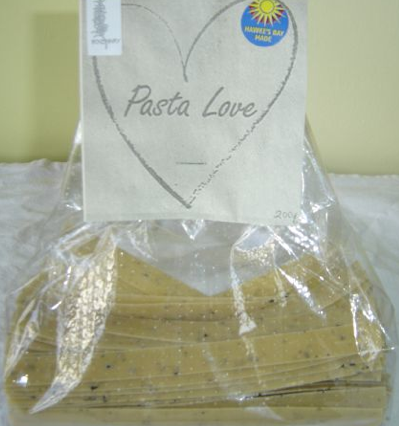 I couldn't go past the locally produced artisan dried pasta from Pasta Love and I chose a Pappardelle made with Rosemary picked from the pasta maker's garden. 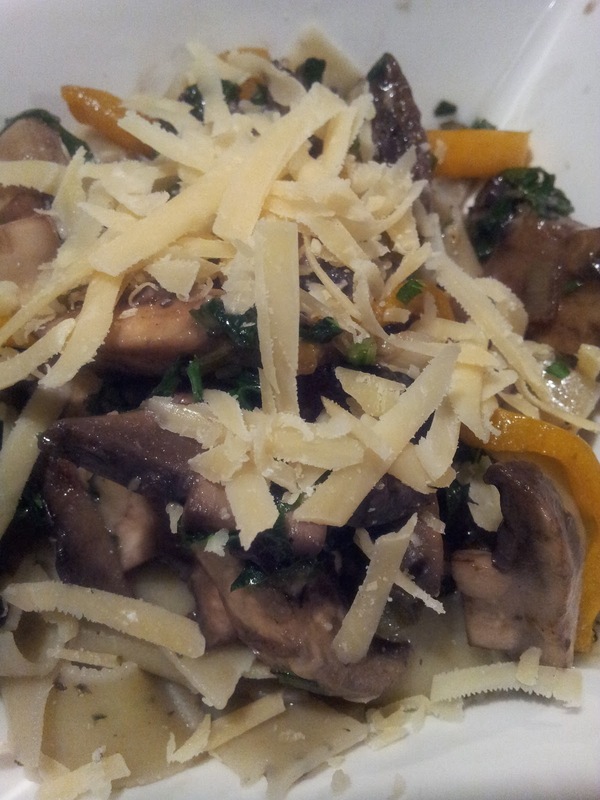 Pappardelle is a flat broad pasta usually 2-3 cm wide. Next I was attracted by the vivid colours of Orcona Chilli 'n Peppers. Their site has some good information on the health properties of chillis. 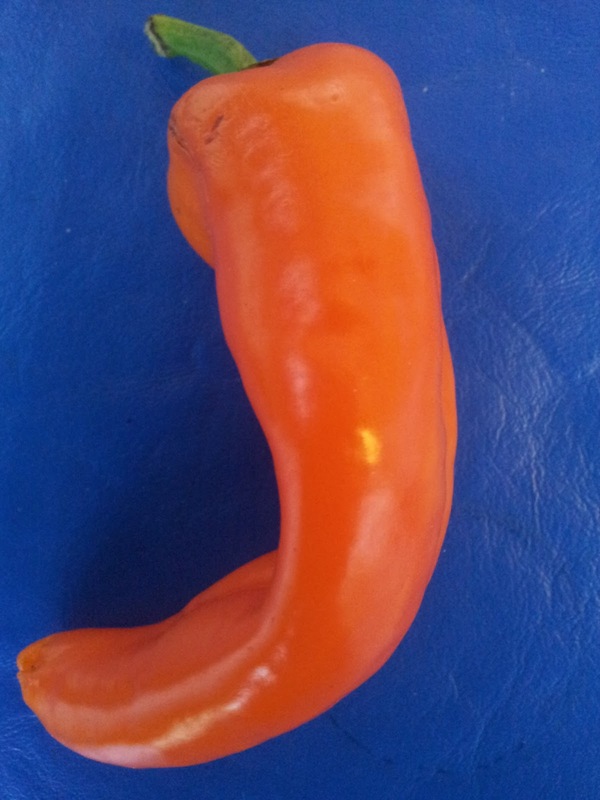 I especially like the orange peppers and this one shaped with my initial. With the addition of spring onions and basil from Monica's home garden I was ready to start the Pappardelle. 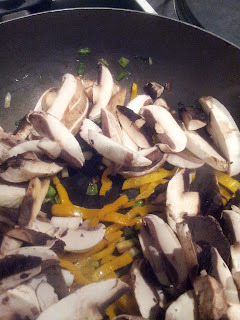 Slice up 4 small spring onions, and two orange peppers, a good handful of basil and as slice as many mushrooms as you like. This was enough for three of us. I don't usually peel mushrooms - just wipe their surface with a damp paper towel - but if the mushrooms were a little older then I would peel them. While chopping up the vegetables, put on a large pot of water and bring to the boil, add about 1 Tbsp of salt once the water is boiling. 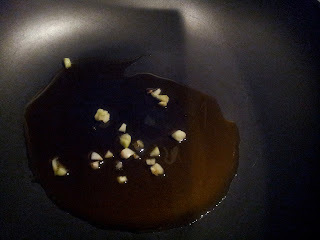 First of all heat from cold a couple of cloves of garlic in olive oil. 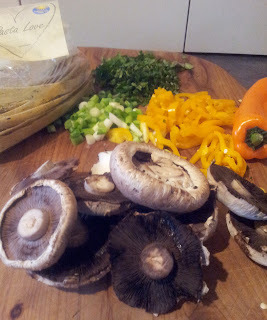 Once the garlic begins to sizzle, add the spring onion and then the sliced peppers. The pasta takes about 9 minutes to cook so now would be a good time to add the pasta to the boiling water (ideally feeding it into the water so that the water doesnt stop boiling). Now add the sliced mushrooms and cook until juicy and soft. 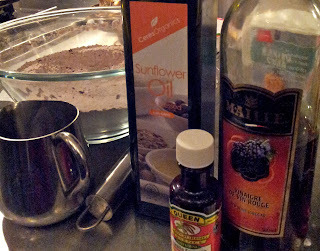 If you think the mix needs some more liquid then add a half cup of water from the pasta water. 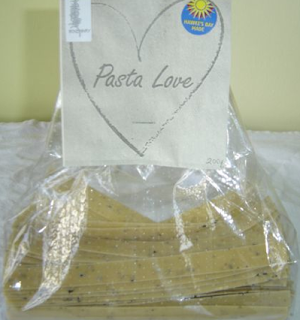 Pasta water is good because the flour gives the water a light thickening quality. When the pasta is cooked, keep aside some pasta water to add to the sauce. Just before serving add the basil and about 1/4 cup of grated parmesan to the sauce. The cheese gives a creamy-ness without adding cream. I prefer to keep the mushroom flavour rich and not diluted by cream but you could add a dollop of cream, sour cream or creme fraiche if you like a creamy sauce. Pappardelle is derived from the verb "pappare" which means to gobble up. The three of us certainly gobbled up this light and tasty sauce on top of the really good pasta. The day before on The Big Easy bike ride after the 30 km mark, we were looking for time off the saddle and for an opportunity to gobble something more substantial than the free apples offered on the trail. Biking along the stopbank with river on one side and vineyards and orchards on the other we came upon a foodie's oasis at The Bivvy Vineyard. How special it is to buy wine from the winemaker and to be in among the vines, with a food truck serving up fresh food. 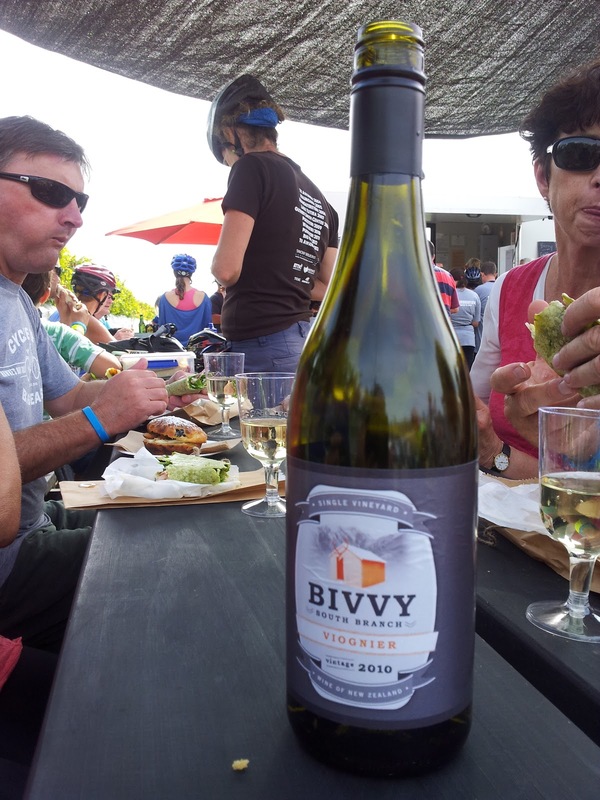 We enjoyed a glass of 2010 Bivvy Voignier and a salmon and salad wrap or a late summer salad with melon, salmon and feta. All credit to the organisers of The Big Easy. Somehow they managed to get this event up and running in 6 short weeks. 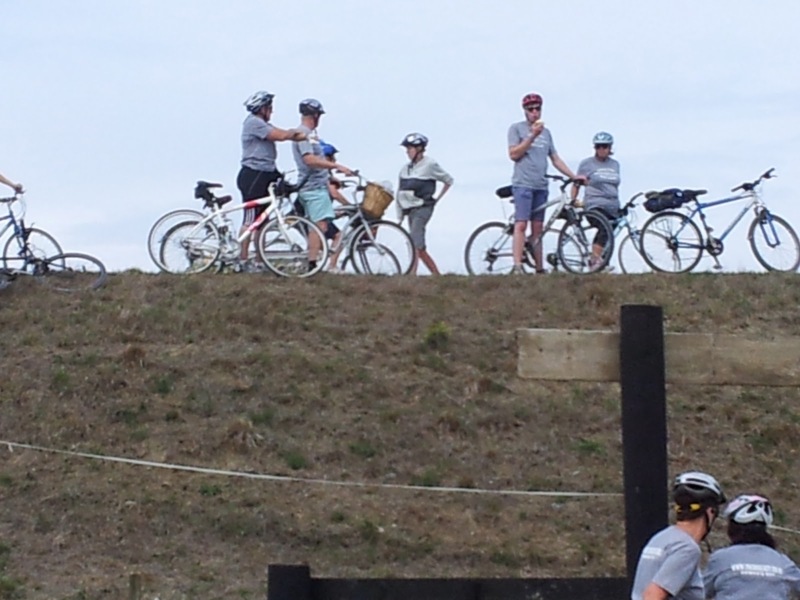 It attracted 700 riders, a mix of locals and visitors, for the inaugural Cycle the Big Easy. How fortunate are the people of Hawkes Bay to have local councils with the vision to provide a network of purpose made cycle/walking pathways away from vehicle traffic. These pathways are comparable to those you find in cycle orientated countries like the Netherlands. 43 kms was about 13 kms too far for me - I was exhausted. 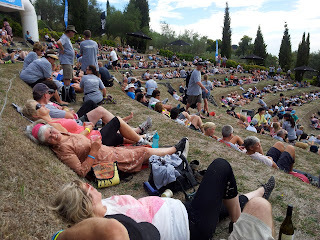 On completion of the trail we got free entry to a concert at the Black Barn vineyard starring The Beat Girls and enjoyed excellent wood fired pizzas and Black Barn wine. Meanwhile our bikes were being wrapped in blankets and taken by Conroys moving trucks back to Church Road where our day began. After the concert we too were given a ride back to Taradale in a bus. All this for $25 per person! 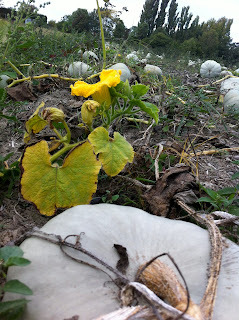 Harvest time is a lovely time to visit The Bay. 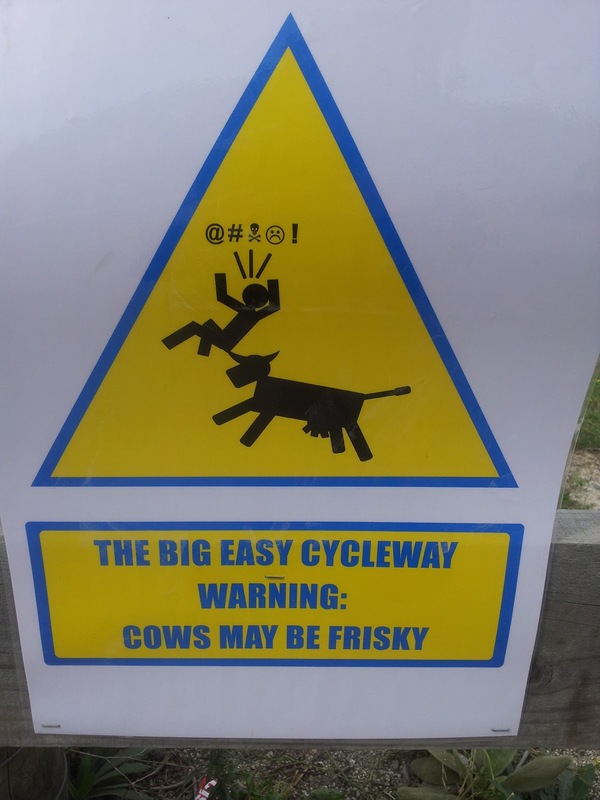 If the organisers decide to do The Big Easy Cycle trail again next Easter, I am sure this would attract bike riders from all over the country.